ucklebury Common is one of the largest Commons in Southern England. It is privately owned by the Bucklebury Estate and stretches from Cold Ash (Bucklebury Alley) in the West to Southend Bradfield in the East. 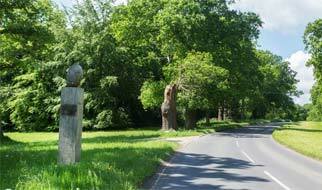 The Common extends to some 900 acres and includes the famous Avenue of Oaks at Chapel Row, ancient woodland at Holly Wood and one of the largest areas of heathland in Berkshire. Whilst the Common is privately owned it is open to the public for fresh air and exercise through a Scheme of Management. The Common has a rich variety of flora and fauna. Conservation of important habitats is undertaken by the Estate through direct management and in collaboration with various voluntary organisations. Commons have existed in England since medieval times. 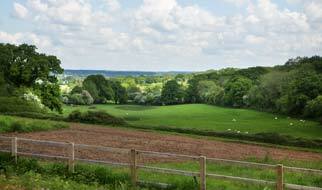 Traditionally Commons were situated within the poorest areas of land (hence most of Bucklebury Common is on gravel). Traditionally, commoners had certain grazing and wooding rights and these were controlled by the Court Baron and Court Leet of the Manor. 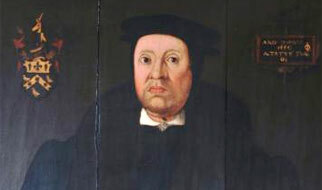 The Court, headed by the Lord of the Manor’s Steward, appointed tything men and jurymen to help regulate the Common. This existed until the late 1920’s when a new Scheme of Management was introduced. The Avenue of Oaks that runs for a mile from Roselands in the East to Chapel Row and then to Bucklebury House to the West, is perhaps the most celebrated area of Bucklebury Common. The inner row of Oaks was planted to celebrate Queen Elizabeth I’s, visit to Bucklebury and the outer row was planted to commemorate Wellington’s victory at Waterloo in 1815. New trees have been planted over the years. 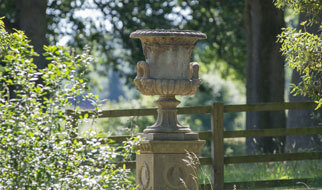 New oaks were planted in 1972/1973 to commemorate the Queen Elizabeth II’s visit to Bucklebury on 26th May 1972. The Princess Royal also planted an oak tree opposite Shingletons. In 2000 a new avenue of Oaks was planted at Chapel Row to commemorate the Millennium. In 2011 a further row of oak trees were planted at Chapel Row Green to mark to marriage of Catherine Middleton and Prince William, now the Duke and Duchess of Cambridge. Two new wooden gate posts were also erected in 2015 at Wood Gate at the Eastern end of the Avenue to mark the Royal Wedding. An important feature of Bucklebury Common is its heathland. Before the Second World War, there was continuous heathland between Upper Bucklebury and Chapel Row. During the Second World War the Common was requisitioned as a transport depot and as a result invasive vegetation took over during the post war period. The Bucklebury Heathland Group in co-operation with the Pang Valley Conservation Group has restored a significant area of Heathland over the years. 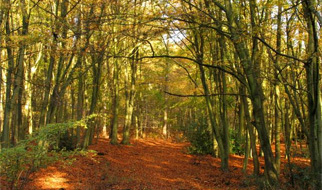 The Common has some notable ancient woodlands, notably at Holly Wood, The Slade. These are managed by the Bucklebury Estate. 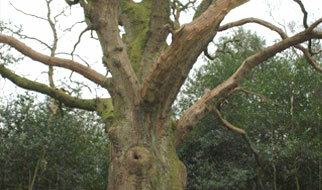 There are a number of veteran trees on the Common including the Coronation Oak near Vanners. The Common has a number of Green’s and they form an important feature of the Common, these include Westrop Green, Hopgood’s Green, Turner’s Green, Byles’ Green, Miles Green, Kiff Green and Chapel Row Green. Traditionally the Common was gated and it was the responsibility of householders to fence against the Common or suffer the consequences of roaming animals. 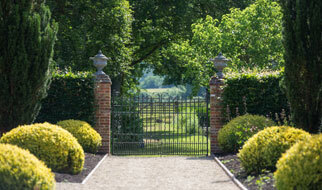 The gates included Wood Gate, Hatch Gate, Beenham Gate, Bradfield Gate, Nuttage Gate and Brown’s Gate and Common Gate. Two new wooden gate posts were erected in 2015 at Wood Gate (the eastern end of the Avenue) to mark the wedding of The Duke and Duchess of Cambridge in April 2011. There were two pounds on the Common. One at the Slade and one at Brown’s Gate. Un-ringed Pigs or unauthorised animals found grazing on the Common were placed in the pound and fined by the Court Baron and Court Leet. The brick pound at Hillfoot has recently been restored and it is one of a handful of pounds left in the country. There are a dozen or so ponds scattered around the Common. The Benedictine Monks of Reading Abbey created a series of seven fish ponds on the Bucklebury Estate, the first two of which are on Bucklebury Common (opposite Nuttage House). 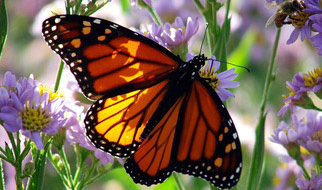 Many were created for animals to be watered at. A great number of allotments were created in the 19th century to provide additional gardens for Commoners. Many of these are still used today and are managed by the Estate. For further details contact the Estate Office. There are more rights of way in Bucklebury than any other parish in Berkshire. While there are dedicated footpaths, the public may walk wherever they like over Bucklebury Common. There are however, dedicated bridle paths and restricted Byways for other users. Bucklebury Common is privately owned. 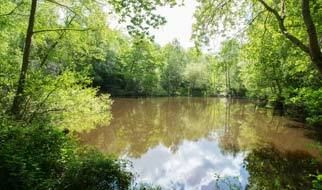 The land, trees, living vegetation, minerals, soil, and ponds are owned by the Estate. The Bucklebury Estate manages the Common, its woodlands and has the power to grant easements or rights of way over the Common. The Estate also deals with all statutory utilities such as electricity, water and telecoms. In 1929 a Scheme of Management was entered into by the Estate and Bradfield Rural District Council in respect of public access and regulation of the Common. The Court Baron and Court Leet ceased to function (although it has been preserved under the 1977 Justices Act) and byelaws were introduced. West Berkshire District Council (which superceded Bradfield RDC) is responsible for waymarking of public rights of way, maintaining the Commoners Rights register, collecting rubbish and assisting with vegetation clearance. They also maintain car parks and public access. The Bucklebury Parish Council has no jurisdiction over the Common. The Parish Council does, however, organise the Annual Rubbish Clearance day. In 2014, West Berkshire District Council transferred the recreational and access aspects of their management role to the Berkshire, Buckinghamshire, Oxfordshire Wildlife Trust (BBOWT) while retaining the management of rights of way, the Commoners’ Register, and the regulation of byelaws pertaining to the Common. The Bucklebury Common Advising Committee is made up of representatives of the Estate, West Berkshire District Council, Commoners and local residents. The Committee meets biannually to discuss general matters relating to the Common. The Bucklebury Common was until 1929 regulated by a Court Leet and Court Baron. The Court headed by the Lord of the Manor’s Steward, appointed Tything men and jury men. Fines for encroachments and releasing unauthorised animals were levied. The Estate has excellent achieves documenting the findings of the Court Baron and Court Leet over many years. Today the Steward of the Manor is Mr Malcolm Poynter, a partner of Charles Lucas & Marshall and a trustee of the Estate. The Court has not met since 1969 (it used to be held at the Bladebone Public House) but it can sit as it was preserved under the Justices Act 1977. Commoners Rights attach to particular households not people. There are approximately 130 houses in Bucklebury that have Commoners Rights. The majority of Commoners rights are in respect of “hedgebote” or “firebote” the right of picking up fallen dead wood from the common for the mending of fences and for fires. Chainsaws are not permitted and all timber remains the property of the Estate. Approximately 20 households have ‘Grazing Rights’ but these are generally not exercised as the Common is no longer fenced or gated. Bucklebury Common has extensive footpaths and bridleways across the common, enabling the local community to benefit from its charm. Beneath this mighty oak, a service was attended by over twelve hundred people to commemorate the coronation of King Edward VII. The Bucklebury Heathland Group continues to work to restore the Common Heathland which was once an extensive of heather and gorse, offering sanctuary to many birds and much wildlife. 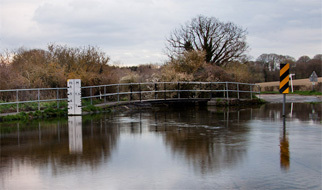 The River Pang is a small chalk stream which runs for 14 miles from Compton to Pangbourne .